A faith-based collective wants restaurants to source eggs from chickens which are not caged. 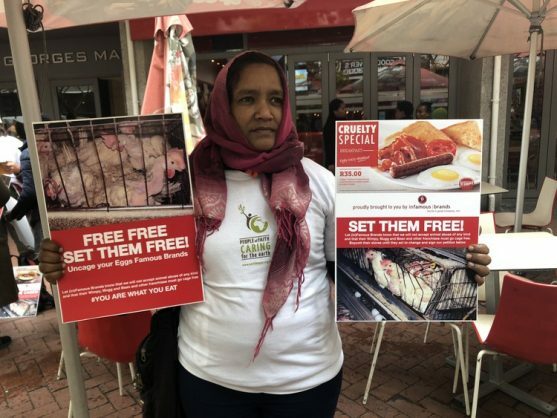 Members of the Southern African Faith Communities’ Environment Institute (SAFCEI) demonstrated outside the Wimpy in St George’s Mall in Cape Town on Thursday, calling the restaurant chain to stop using eggs and chickens farmed in cages. SAFCEI launched its animal justice campaign a year ago to highlight the conditions of caged animals, especially chickens, and push Famous Brands, which owns the Wimpy franchise, to source “cage-free” eggs and chicken. Campaigns coordinator Mandla Gqamlana said the company had started talking to Famous Brands in August last year and had met the company at its head office. He said Famous Brands management had listened to their argument but had expressed concerns about whether there would be a sufficient supply of cage-free eggs. He said the coalition had provided a list of cage-free suppliers to Famous Brands in August 2018 but since then the company had “gone to ground”. Frank Molteno, a volunteer with SAFCEI and head of the animal justice campaign, said McDonalds had promised to source “cage-free” chicken and eggs by 2025, following public pressure from SAFCEI in cooperation with Humane Society International, Beauty without Cruelty, and Compassion in World Farming. Molteno said the coalition was aiming to push Famous Brands to source “cage-free” by 2025. Gqamlana said SAFCEI would seek government action under the Animal Welfare Act if Famous Brands did not respond. In a statement, Wimpy said it supported the goal to source 100% cage-free eggs. But, it said, the company did not supply eggs to the restaurants; each restaurant operator sourced his or her own eggs and “does not knowingly or deliberately use eggs that are not cage free”. “We are investigating opportunities to ensure the supply of eggs to our restaurants aligns with the cage-free policy,” Wimpy said.